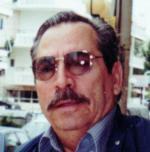 ANTONIOS M. PLEVRAKIS, age 79. Dear father of Matthew (Barbara) and Libby (Zoltan) Tamas; grandfather of Anthony (Kristie) and George Plevrakis and Michael (Lauren), Christina and Alexis Tamas; great-grandfather of Abagail and Lilly; brother of Kostas, Leanora Vathe, Ekaterine Yianareli and the late George Plevris. Funeral service 9:30 AM SATURDAY at St. Demetrios Greek Orthodox Church 22909 Center Ridge Rd. Rocky River. The family will receive friends 4-7PM FRIDAY AT BODNAR-MAHONEY FUNERAL HOME 3929 LORAIN AVE. CLEVELAND AND 8:30-9:30AM IN CHURCH. Interment Lakewood Park Cemetery, Rocky River, Ohio. Our deepest condolences to all of you and your families. Our prayers are with all of you at this very difficult time.